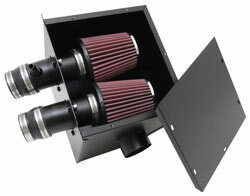 63 Series intake systems are street legal in most states. However, they are not legal for use in California and other states adopting California emission standards. K&N's high flow airbox assembly for the Polaris Ranger RZR replaces the stock airbox and intake tract with an oversized airbox, larger air filter, and aluminum intake tube to offer better throttle response, increased horsepower and longer service intervals. The airbox and intake are black powder-coated to withstand the elements. A separate crankcase breather keeps the air filter cleaner while dissipating the heat and oils generated by crank pressure. For increased protection a K&N DryCharger® is supplied for extreme conditions. No fuel management modifications are necessary to receive increased performance. K&N's high flow air intake system for the Yamaha YXR700 Rhino replaces the stock airbox and intake tract with an oversized K&N high flow air filter, aluminum intake tube, and aluminum heat shield (where applicable) to offer better throttle response, increased horsepower and longer service intervals. The heat shield and air intake tube are black powder coated to withstand the elements. For increased protection and longer service intervals a K&N DryCharger® is supplied for extreme conditions. No fuel management modifications are necessary to receive increased performance. K&N's high flow air intake system for the Yamaha YXR660 Rhino provides an estimated performance increase of 4.35 hp and 3.5 foot-pounds of torque for the popular Side-By-Side off-road vehicle. 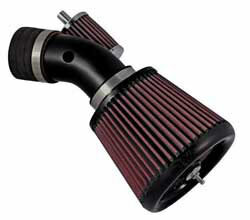 To achieve such gains, K&N replaces the stock Yamaha air filter and airbox with a complete redesign of the Rhino's intake system that draws air through a reverse-tapered K&N XStream RX filter and a powder coated aluminum intake tube. 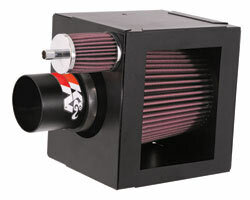 The new intake configuration functions like K&N's world famous car, truck and SUV intake systems, directing a more laminar flow of air to the engine, while the K&N air filter increases surface area and filtering capacity. Additional components include a chrome crankcase breather, which allows for cooler air intake, a K&N DryCharger® designed to protect the air filter in extreme conditions, and a carburetor main jet for easy air/fuel mixture tuning. 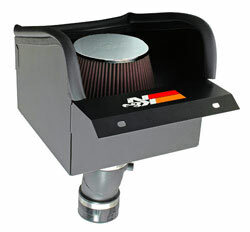 The K&N Rhino intake system offers guaranteed horsepower and a torque increase that no Rhino owner should live without.